The Ford Center offers excitement for everyone! 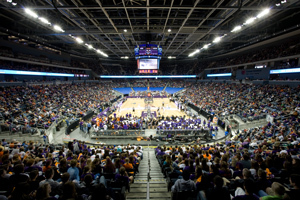 Located in downtown Evansville, the Ford Center is the new home for sports and entertainment. If your company is interested in advertisement or partnership opportunities please contact Sales and Marketing Manager, Kristi Spalding at 812.436.7157 or email kspalding@thefordcenter.com. Let the Ford Center connect your brand to Evansville’s greatest and unforgettable experiences!